Eastern Washington fans celebrate after the first of three missed field goals by Weber State kicker Josh Kealamakia. As one meanders through the campers and barbecues that fill the north parking lot at Roos Field in Cheney there is a palpable energy that fills the crisp autumn air. 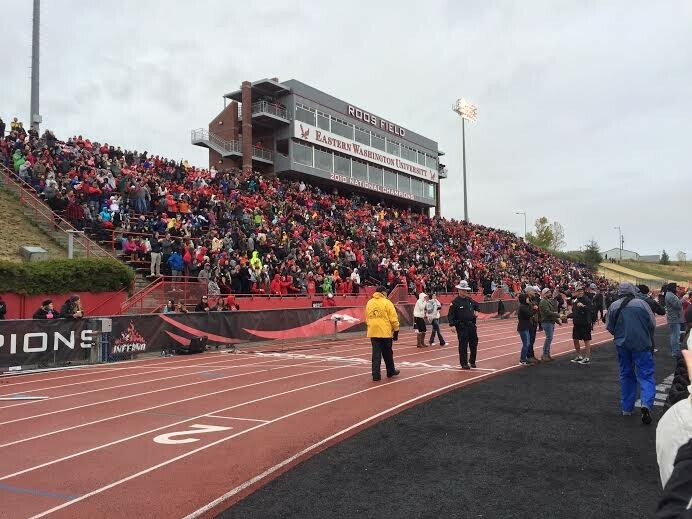 This was no different on Halloween afternoon as the fifth-ranked Eastern Washington Eagles (6-2, 5-0 Big Sky) defeated the Weber State Wildcats (4-5, 3-3 Big Sky) at "The Inferno" in a pivotal conference game. In the end, it was the Eagles who came out on top, 14-13, but, as the score indicates, it was a tough win. Facing a second-straight windy home game in which wind speeds exceeded 20 miles per hour, Jordan West and the Eagles offense got off to a slow start, managing only 27 passing yards and 62 total yards in the first quarter. Establishing the passing game early, Weber State racked up 115 yards through the air in quarter number one, allowing the Wildcats to run the football successfully and get out to a 10-0 lead. The Eagles' fortunes began to change in the second quarter as a timely tip was intercepted by linebacker Alek Kacmarcik. The redshirt freshman has taken advantage of his opportunities thus far, ranking second on the team in tackles per game (7.8) in addition to two sacks, an interception and a fumble recovery. Kacmarcik's snag turned out to be an important moment in the first half, as it led to a 40 yard touchdown reception by Cooper Kupp on a crucial fourth down attempt. 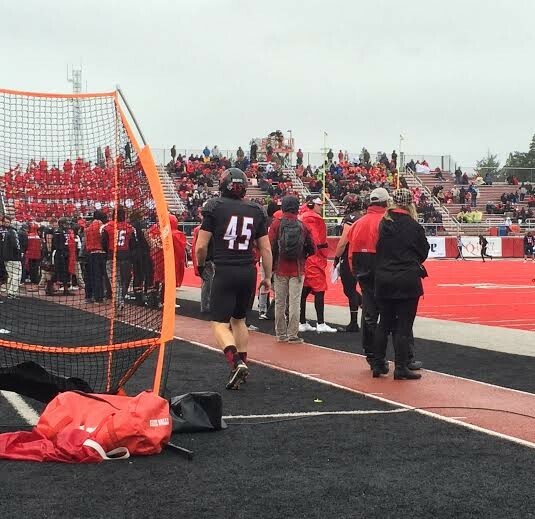 The score was Kupp's 53rd career touchdown catch, bringing him within five of David Ball's FCS record of 58. The Wildcats responded with a methodical, six minute and 52 second drive that ended in a 24 yard field goal from Josh Kealamakia, bringing the score to 13-7 Weber State. As a windy, grey first half came to a close, the Eagles—who have seen five of their seven games thus far decided by one score — found themselves once again in a close battle. The Eagles defense came out with gusto in the second half, forcing a quick punt by Weber State to get the football back in the hands of Jordan West. Shortly following a big third down conversion to Kendrick Bourne, the Eagles lined up to attempt a huge fourth down conversion inside the red zone. And right on cue, just as they have done all year in crucial situations, West hit Cooper Kupp with an absolute dart, just past the first down line. Three plays later, it was West and Kupp once again on a four yard connection for number ten's second touchdown catch of the game and the 54th of his illustrious career. With the Eagles leading for the first time all day at 14-13, one could feel the momentum swinging in Eastern's favor. Then, the wind and rain picked up, and things got a little weird. Fast forward one quarter, and thanks to a pair of missed field goals by Kealamakia and an inert Eagles offense, the score remained the same with two minutes and twenty seconds left on the clock. With the ball on the Eastern 23 yard line, the Wildcats turned to their struggling kicker once more as the wind continued to gust seemingly from every direction. The ball was snapped, cleanly placed, and sent soaring through the air by Kealamakia... wide right. A third straight missed field goal for the senior kicker, and another bullet dodged by the Eagles at Roos Field. The Wildcats did get one more chance with just over 40 seconds left in the game and the score still sitting at 14-13 Eagles, but the Eastern defense was too much for Weber State quarterback Jadrian Clark and his offense. It has been truly unbelievable that the Eagles have pulled off victories over and over again in the face of adversity. In their six wins, Eastern has won by a total of only 34 points, averaging a margin of victory of only 5.7. While Baldwin would surely prefer bigger victories, his football team has shown some serious heart on a weekly basis in order to achieve their current 6-2 record. Still undefeated in Big Sky Conference play, the Eagles seem poised for a run at another FCS playoff run, and the team's experience in close games this season will likely help them toward achieving that goal.